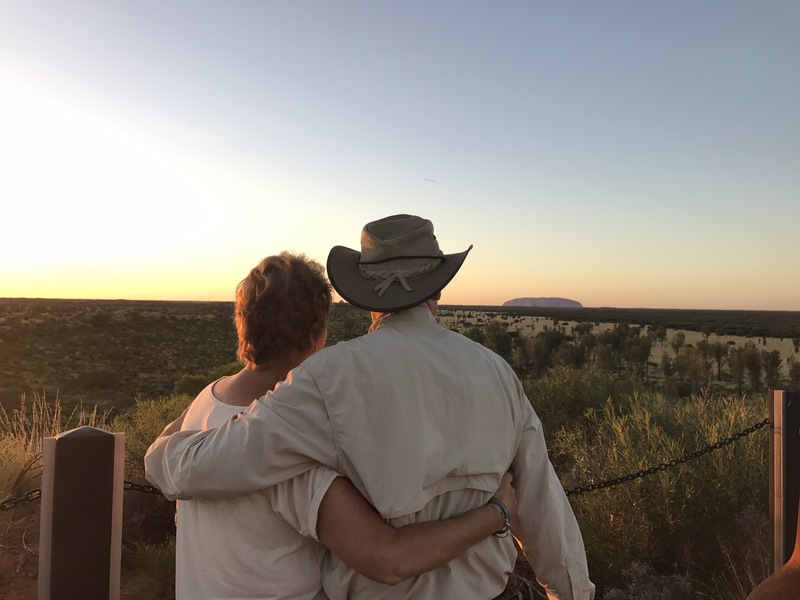 We were up very early yesterday to catch our flight from Brisbane to Ayers Rock, the flight was at 6:30 so we needed to get up at about 4:30. We saw the sun rise over the airport! 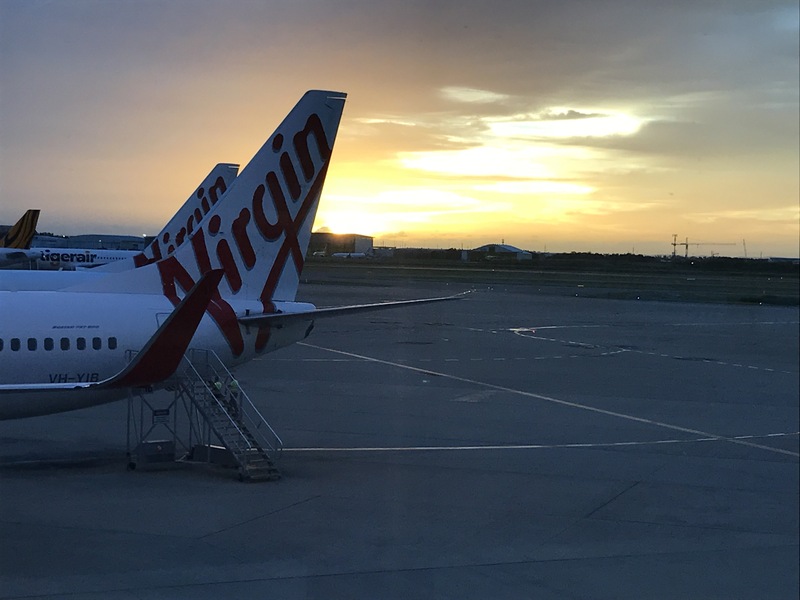 We traveled on Virgin Australia to Sydney where we changed planes for the trip to Ayers Rock. They had a system that you could use with wifi on board to watch TV, movies, play games, listen to music, take a class, etc. I watched a movie I have been wanting to see – Manchester by the Sea. And I can see why Casey Affleck won best actor for it. I wonder why airplanes can get good wifi and the Insignia can’t? 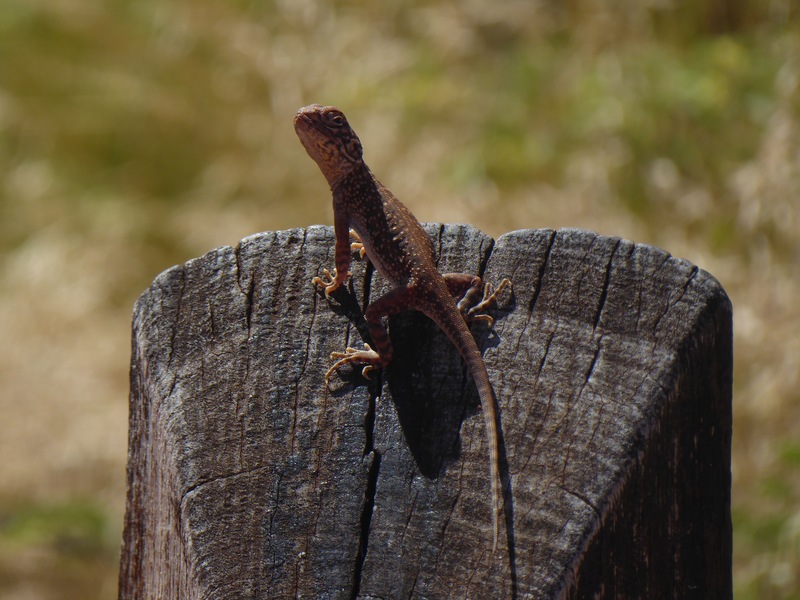 You will also notice the full size pictures in this post because this entire resort has high speed internet – it works everywhere you go in the whole resort which consists of 3 hotels, an apartment/hotel and a campground. It also has several restaurants and shops, a theater, an art gallery/museum, spa, camel farm, tennis and volleyball courts and a supermarket. And here’s the other sign that greeted us! 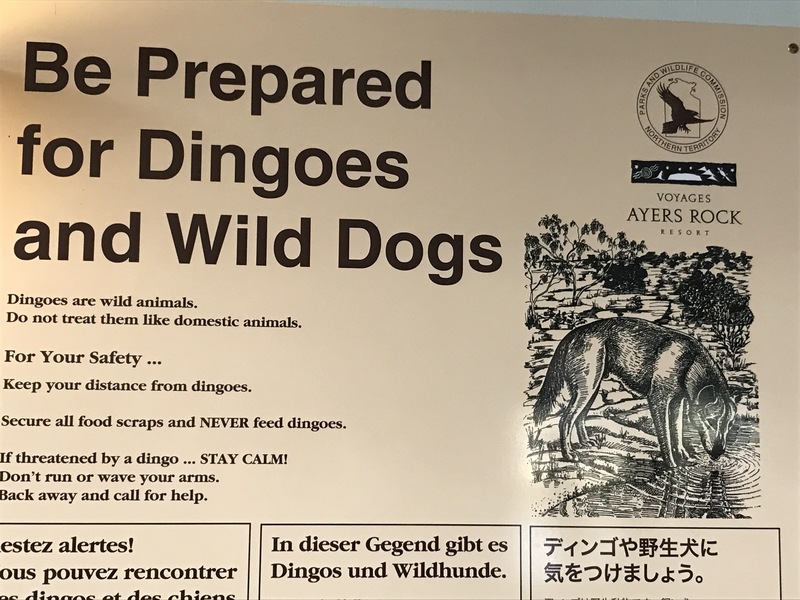 We checked in at Voyagers Ayers Rock Resort – the Desert Garden Hotel and got our arrangements for the tours we had booked. The view of the rock from our room is beautiful. 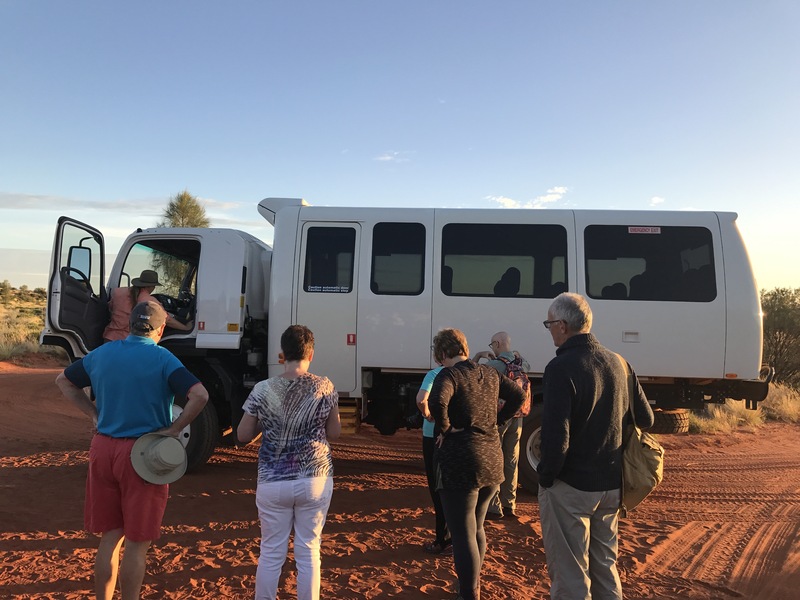 Our first tour was called Sounds of Silence and it took us to a viewing platform overlooking the Uluru-Kata Tijuta National Park. 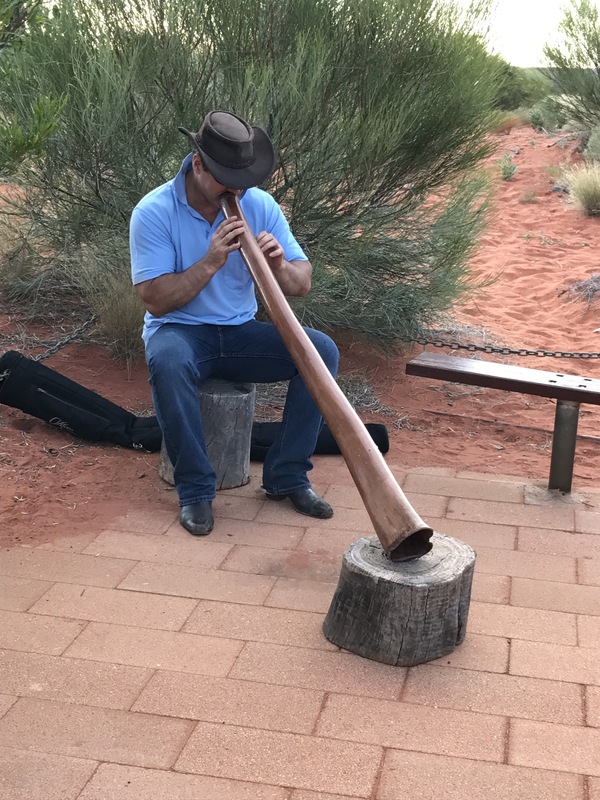 We were greeted with sparkling wine and canapes while being entertained by the humming sounds of a didgeridoo. 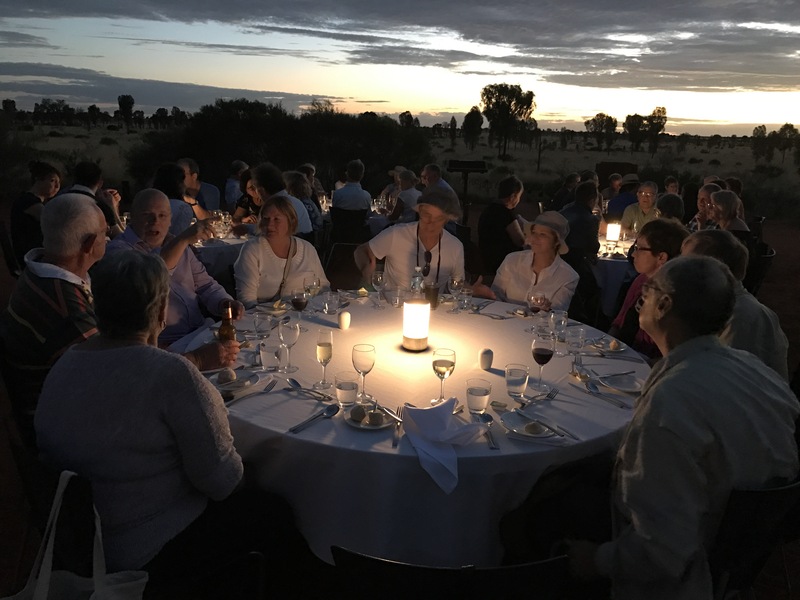 As the sun set and it got dark, we moved to a close by location and had a wonderful dinner under the outback sky. 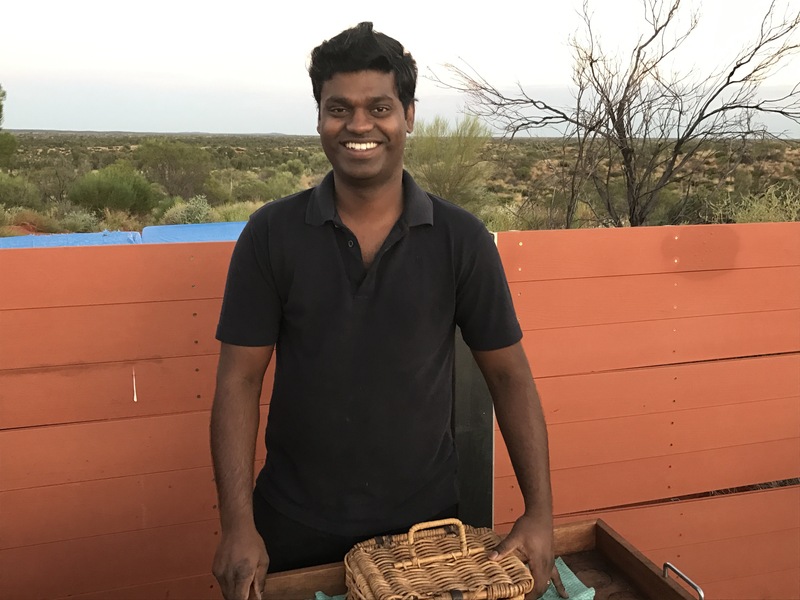 We had a “bush tucker” buffet that incorporated native bush ingredients – crocodile, kangaroo, barramundi and quandong. We were also entertained by indigenous dancers. Norm had a cucumber crocodile canape and he said it tasted like a mild tuna fish. After dinner, the resident star talker described the southern sky as we had our dessert, tea, coffee and port. He pointed out many of the constellations including the southern cross which appears on the Australian flag. It was a truly unforgettable experience. We met some great people, at our table there was a couple from Australia, one from the UK (Devon), one from Toronto and one from Salt Lake City. The wine flowed all night and although we were tired, we wanted it to go on forever. And this couple got married there! 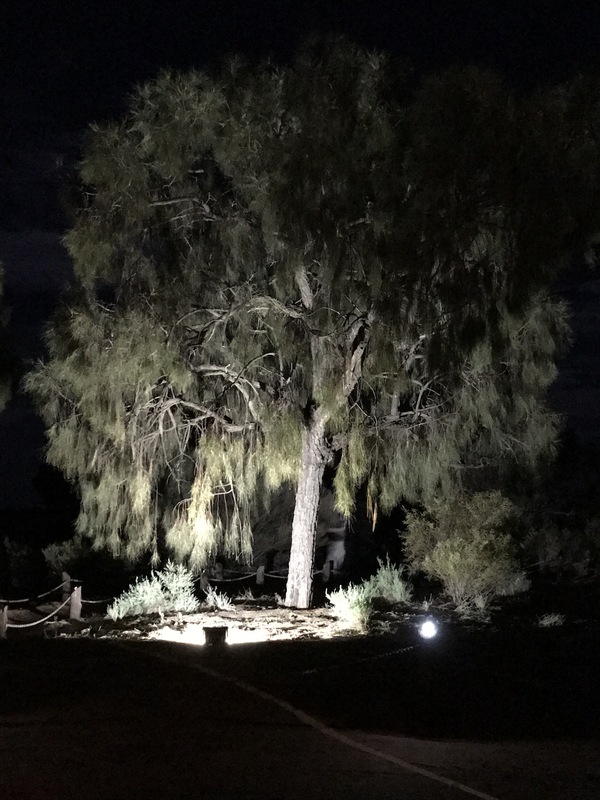 We returned to the resort and conked out for the night as our wakeup was at 4:20 for a 4:50 departure – our next adventure – Desert Awakenings. Amy Pierce, our guide, met us right on time in a huge off road truck like vehicle. There were 18 of us on this adventure. I will describe it first, then give a bit of what we learned in our 6 hours with Amy today. 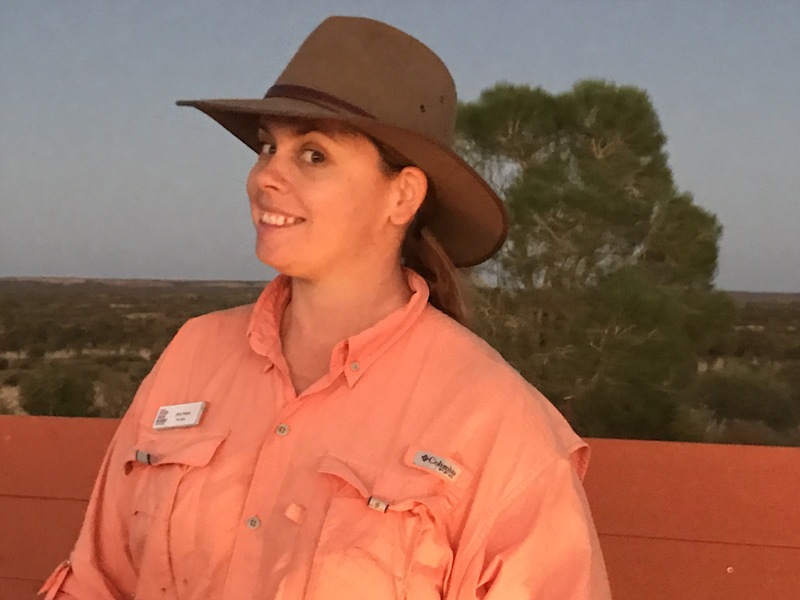 We went out into the bush in the pre dawn – and the sky was so clear and beautiful, I don’t think I have ever seen so many stars. 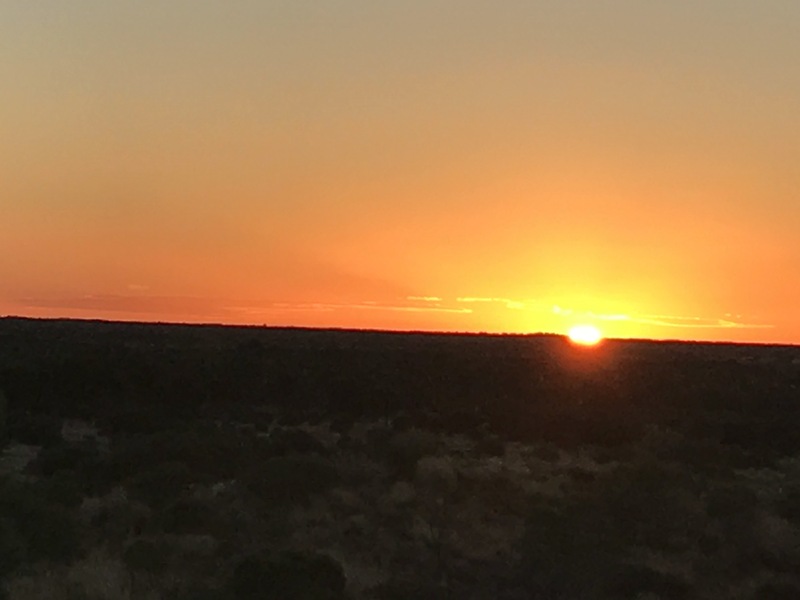 We had a traditional Aussie breakfast of fruit, fresh baked danish, homemade damper (a traditional bread served with golden syrup) and bacon and egg rolls as the stars faded and the sun rose. It was so beautiful, that, as I have said so many times – photos cannot capture the experience. 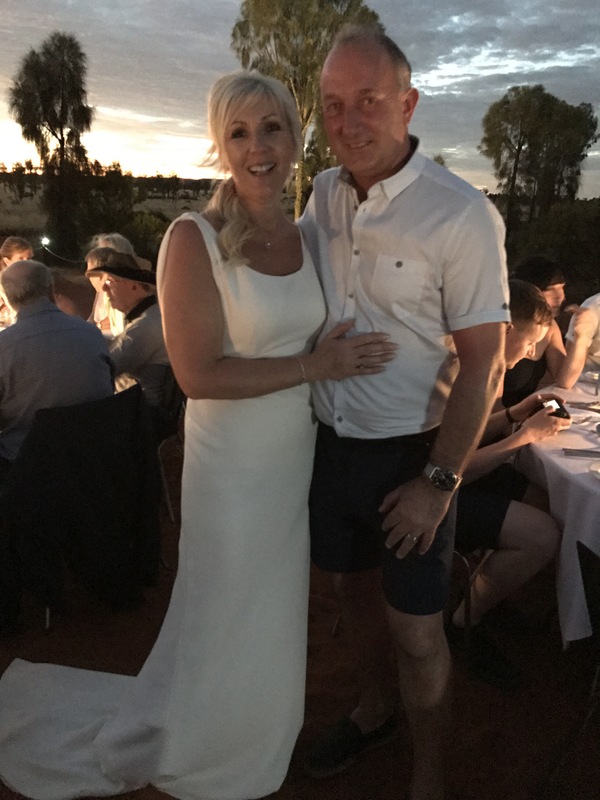 And here’s Amy and our chef! 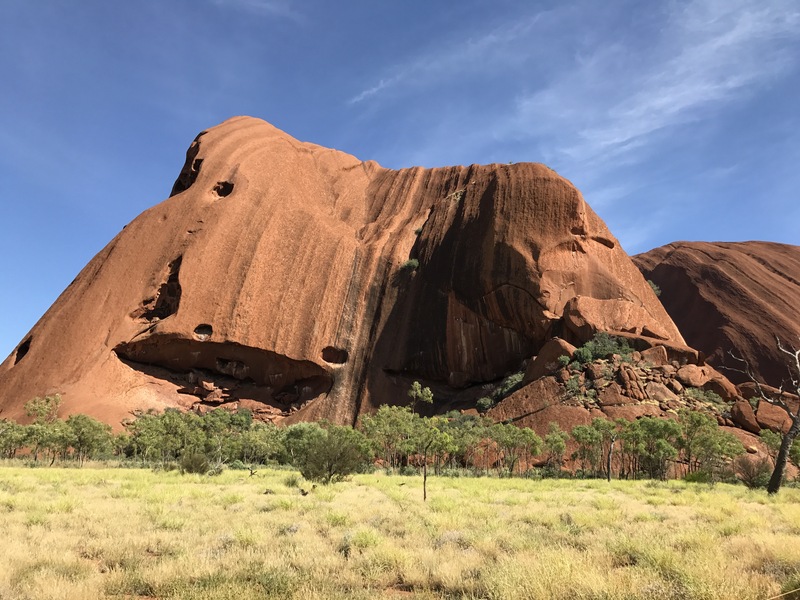 This is the central desert region of Australia and has been home to the Indigenous people – the Anangu – for tens of thousands of years. No one really knows how the huge rock formations were created. Geologists have one theory and the native people have another – that this is sacred and cannot be explained. This is a sacred and spiritual land to them. 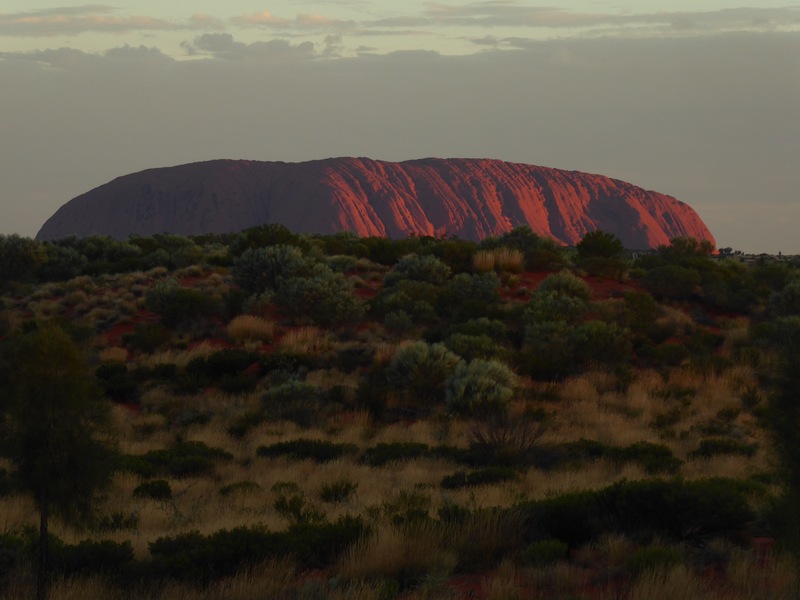 In 1984 the Commonwealth Government handed the Uluru National Park back to the Traditional Aboriginal Owners. It is now a National Park and the resort is managed by Voyages which has a commitment to increase Indigenous employment. The resort now employs about 900 people and 30% are Indigenous. They hope to have this up to 40% by the end of next year. 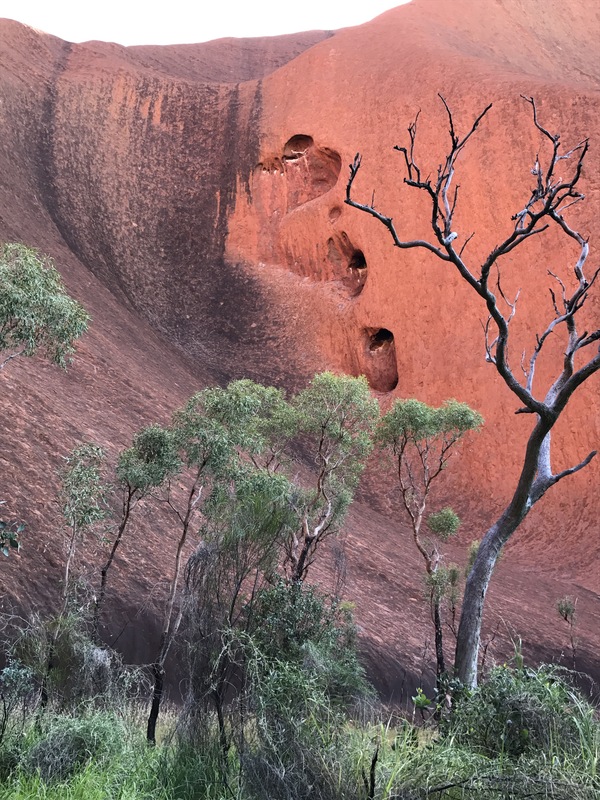 After our breakfast, Amy took us all around the National Park and explained the stories and legends that the Anangu teach. They believe in Tjukuya – that they should teach the next generations how things came to be, how to behave toward each other and how and why things happen. Amy proved to be a wonderful story teller, in fact, when we visited the cultural center later, we knew all of the stories that were on display there. 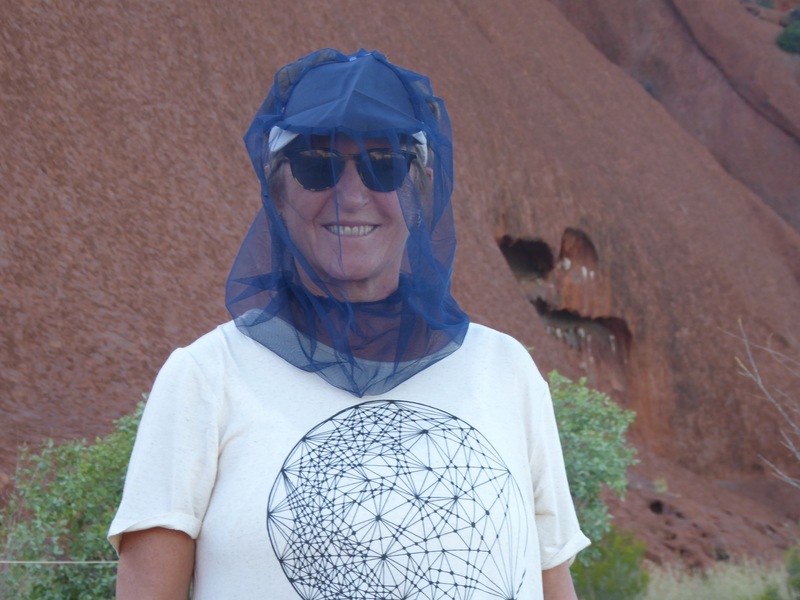 We had heard from friends that the flies can be bad, so we got these fashion statement fly nets – and we were glad we did! 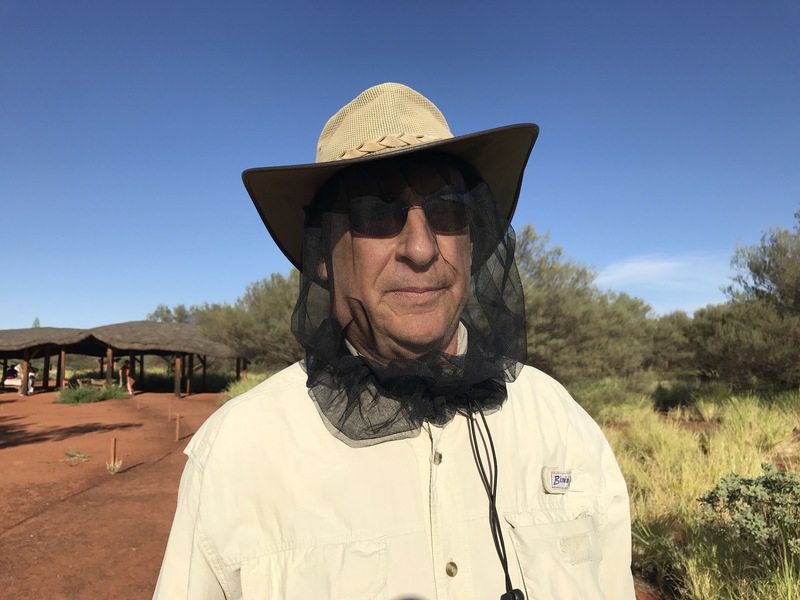 We learned about the creatures here – lots of spiders, 400 species of lizard, mammals including kangaroo (we didn’t see any), snakes and many varieties of birds. 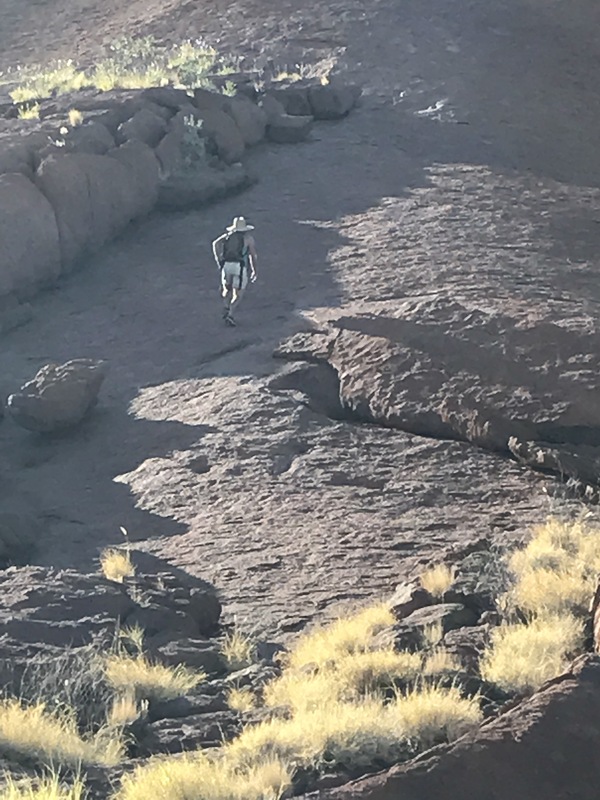 We also learned that to climb the rock is considered to be sacred and that the Anangu people ask visitors to their land to respect their wishes, culture and law by not climbing. 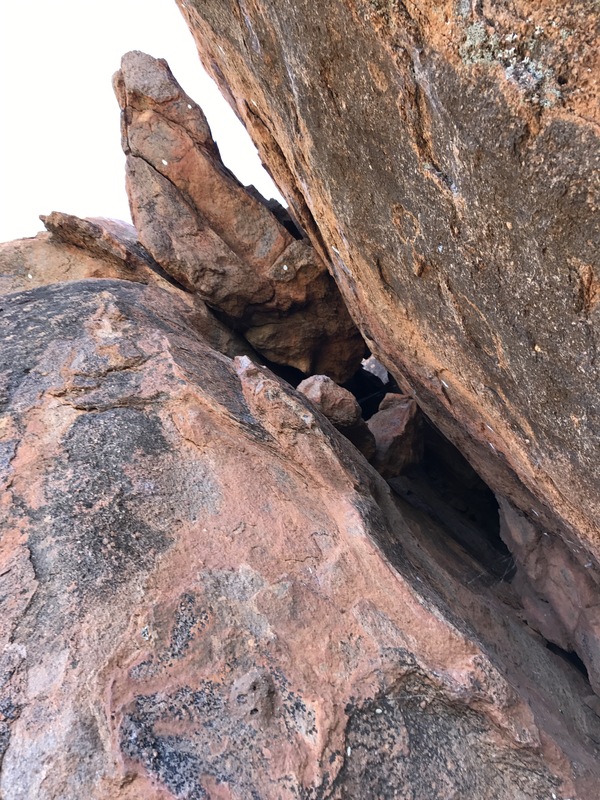 That said, there is a climbing area for those who feel they must do it, and we did see some going up there. 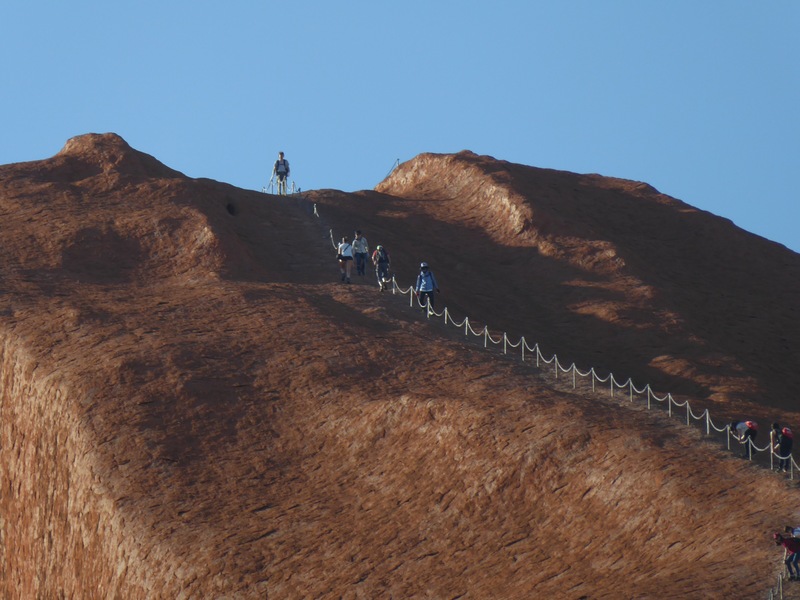 It is a hard climb and causes environmental damage. Some have died. 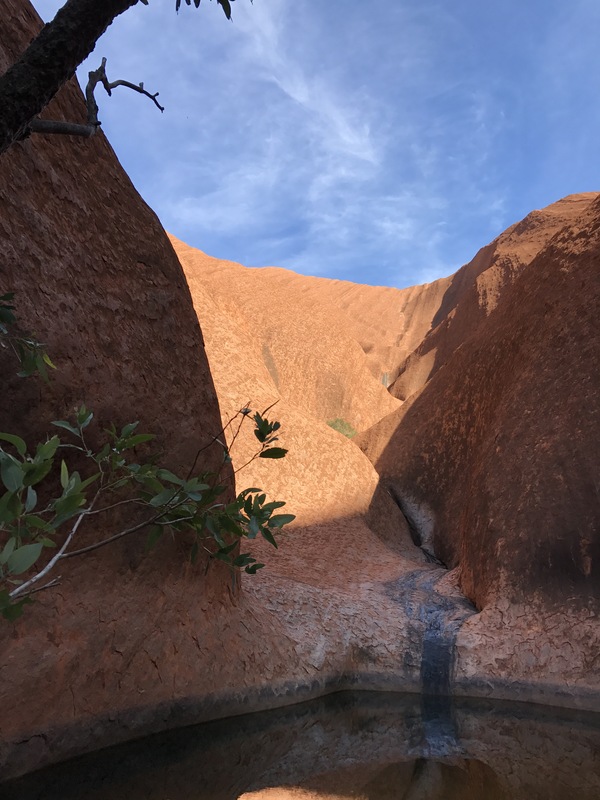 This National Park encompasses more than 327,414 acres of the desert outback and is home to two of the world’s most iconic rock formations – Uluru and Kata Tijuta. 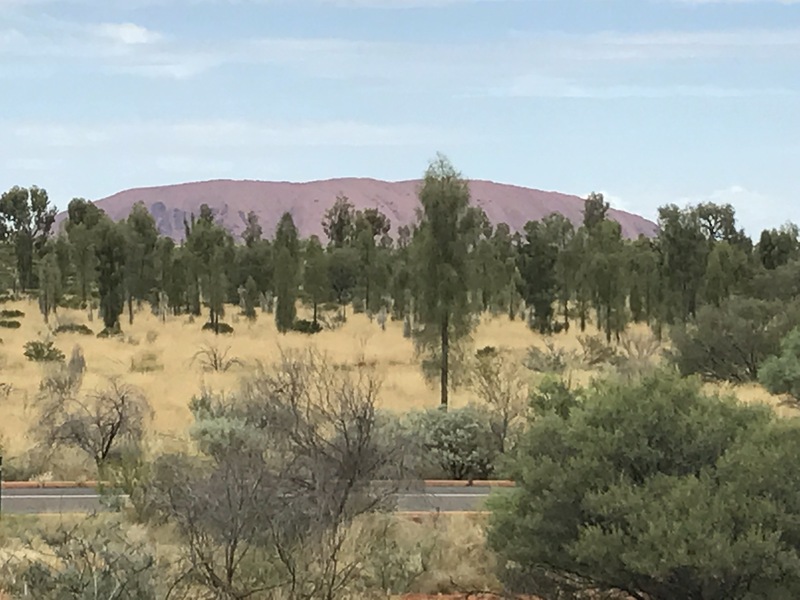 Uluru is more than 348 meters high, it is higher than the Eiffel Tower. 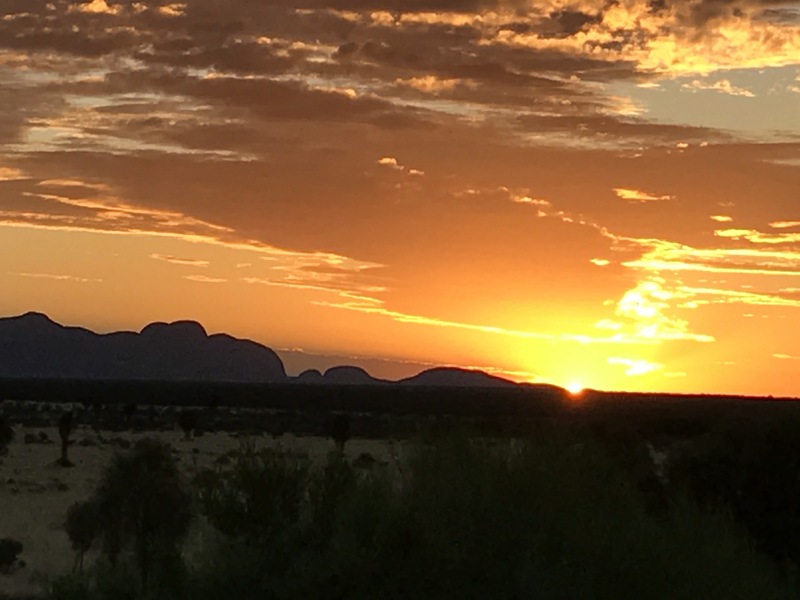 It continues below the ground for possibly 5 – 6 km.Kata Tjuta consists of 36 domes, thi highest rises 198 meters higher than Uluru. Both are spectacular and change almost constantly in the different light. 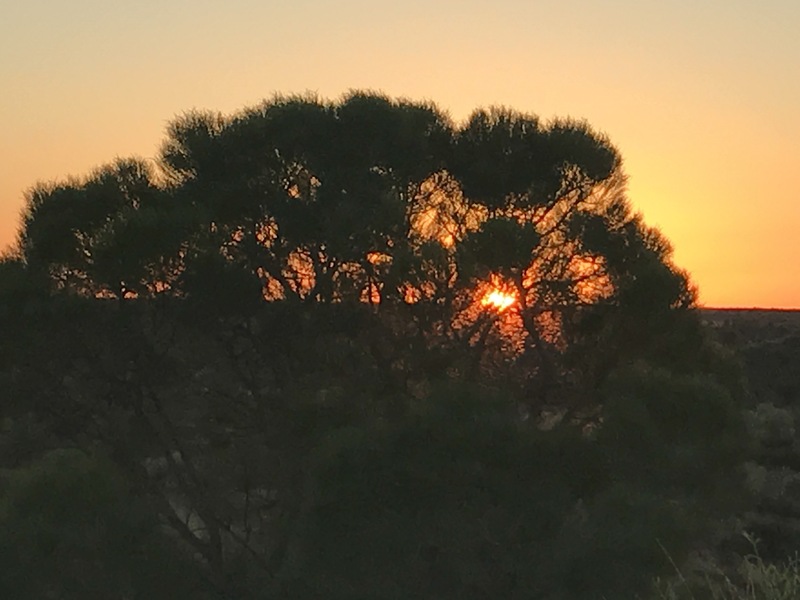 Sunrise and sunset are the most beautiful which is why we booked the tours we did. The Park is a dual World Heritage site for both its cultural and natural values. 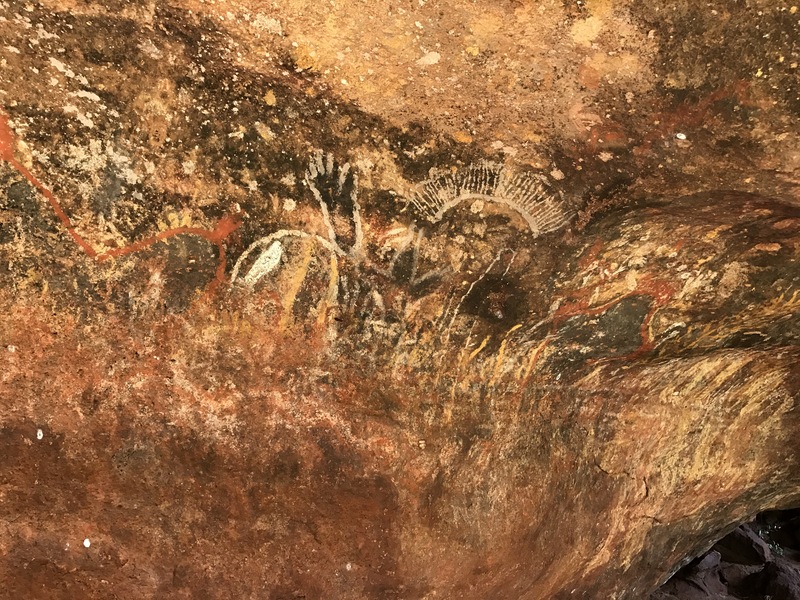 The Anangu paintings are created for educational and ceremonial purposes. The symbols are similar to the cave drawings we saw. They had some artists working in the cultural center but photos were prohibited there. We made purchases of these two paintings. 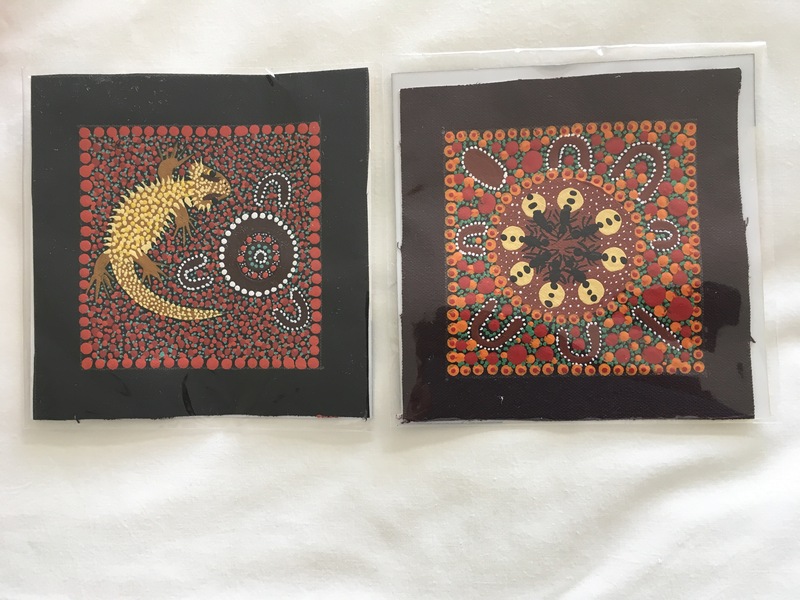 The one on the left is the bearded lizard and the one on the right represents the honey ants that are dug up and eaten by the native people. We got back from the tour about 11:30 and had lunch – then we went to a Mani-Mani Indigenous Cultural theater production. 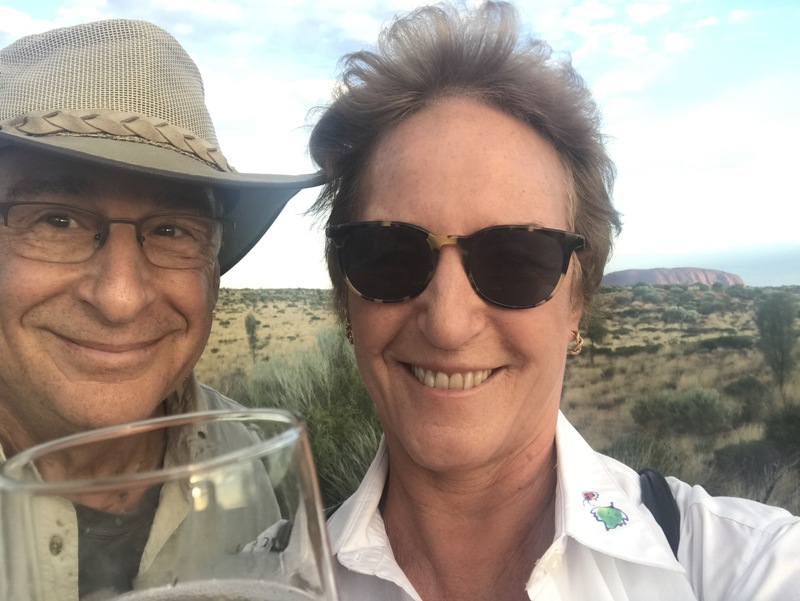 It is very hot here so I am now writing this in the cool comfort of our room overlooking Uluru (Ayers Rock). I’ll have a swim in the pool before dinner and then we will pack up for our flight to Darwin tomorrow morning. This has been a moving and probably once in a lifetime visit that we will never forget. In fact, Amy gave us time to just breathe and take it all in at the end of the tour. 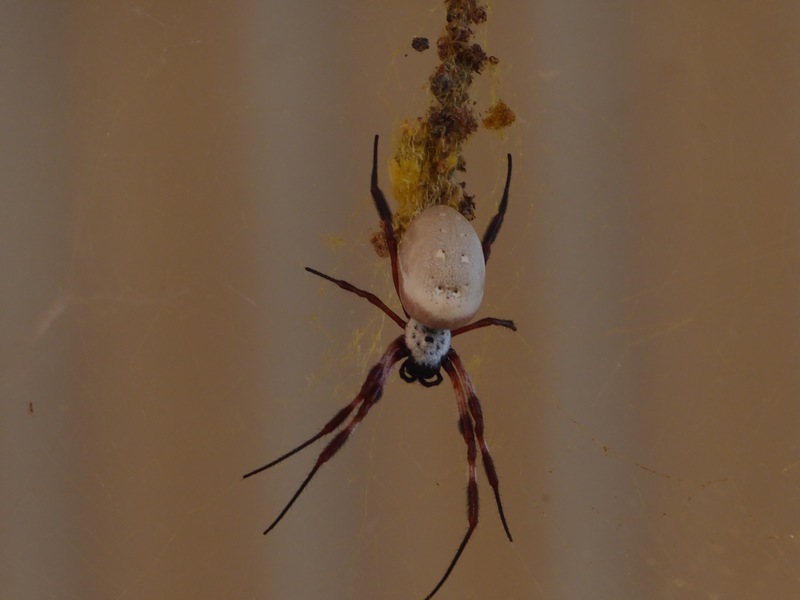 This entry was posted in Australia, Excursions, March, World Cruise 2. Bookmark the permalink.